He had been standing in front of the Christmas tree in Manger Square for less than 10 minutes, and already two cousins had greeted him warmly, exchanging news and pleasantries. 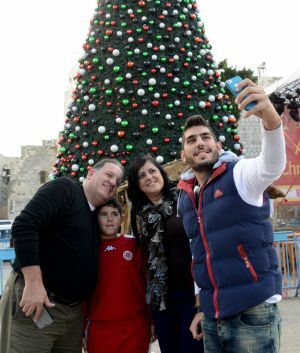 A native of Nazareth, the 48-year-old Catholic is following the tradition that his father — who was born in Bethlehem and went to live in Nazareth — began with him as a child: Hazboun brings his wife and children to visit the city every Christmas. It also warms his heart, said Hazboun, a photographer, to be able to spend time with so many of his relatives. 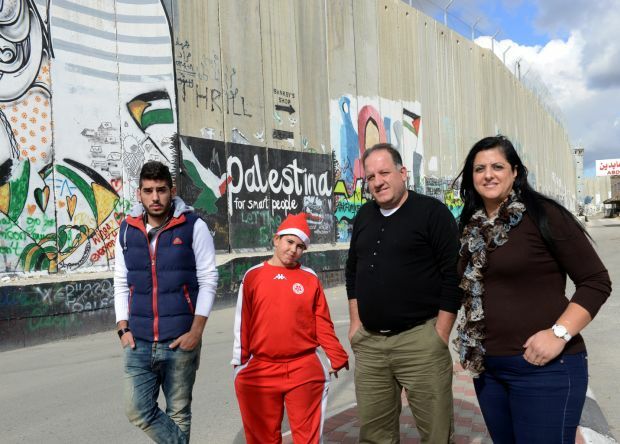 Citizens of Israel, Hazboun and his family said that their own experiences crossing what is known as Rachel’s Tomb checkpoint into Bethlehem have varied. They are normally asked to present their identification cards, and sometimes they are just let through. “They don’t mind us getting in, they just don’t want us coming out,” he said. On the return trip, they are usually stopped by the Israeli soldiers at the checkpoint, he said. This year he took a back way into the city, because last year his car was pulled off to the side, the family belongings were taken out and searched, and, he said, they were herded “like cows” into a room for a body check. Sometimes the line leaving through the Bethlehem checkpoint is backed up several cars deep and takes a considerable time to get through as the soldiers check everyone who is leaving. There is a separate checkpoint for pedestrians as well. While technically Israel forbids its citizens from entering the West Bank for their protection — during the intifada some Israelis who mistakenly entered Palestinian cities or were lured into Palestinian territory via the Internet were murdered — Arab citizens of Israel are normally unofficially exempt from the ban. All Palestinians from the northern West Bank must travel a roundabout road in order to reach Bethlehem, and during the Christmas season, though travel restrictions are eased, Christians must nevertheless have special travel permits to visit Bethlehem. The Latin Patriarchate of Jerusalem said this year, Israel issued some 25,000 travel permits for West Bank Christians as well as some 700 travel permits for Christians from Gaza for the entire Christmas season, which also encompasses the Greek Orthodox Christmas in January. Her younger son, Jowan, 8, said he is scared when he sees the soldiers. “They have real guns,” he said. The Hazbouns only used to visit Bethlehem on the holidays, but since their oldest son, Fadi, 20, began studying cinematography in Bethlehem last year, they come more often. The family members believe the people of Bethlehem are good, but all said there was a nagging fear that someone might harm Fadi Hazboun if they find out he is Israeli. The parents said they call him often and worry if they are unable to reach him. Fadi Hazboun said he chose to study at a Palestinian university because he was concerned an Israeli degree would limit his career within the Arab world. Sometimes he travels to Bethlehem alone, and as a young man he is often stopped by the soldiers. Nardin Hazboun said two months before her father died this year, he gave blessings to all his children, and for her he wished that she would be able to travel freely back and forth from Bethlehem. And on Christmas Eve, in addition to her prayers for the health and success of her children, she will also pray that her father’s blessing will become a reality.